The Northwest Coast region covers the coast of southeast Alaska,B.C,Washington and Oregon. It also includes the many islands near the coast. It is surrounded by the Coast and Cascade mountains to the East and the Pacific Ocean to the West. The different types of terrain in the Northwest Coast include mountains, marches, coastline, beaches, inlets, rivers, lakes, fjords and alpine tundra. The climate in the Northwest Coast is mild and wet. The northern coast and Islands get an average 156-655 cm of rain in a year.The goergia strait gets an average of 65-175 cm of rain in a year. The average tempretur is from above zero to 18 degrees celsuis. Precipitation is very frequent in the Northwest Coast creating lush vegetation.The region is warmed by the Japanese Current. In the summer the area is subject to thunder storms, whirlpools, cross currents, and riptides. Although this region was not ideal for farming it contained an abundance of food and resources. The sea contained whales, otters, sea lions, sea otters,and fish such as halibut, salmon, smelt, herring, cod, and sturgeon. The ocean also provided the people with shellfish. The forests also contained their share of natural wealth. Bears, elk, beavers, deer, and porcupine could be found in the forests of the north west coast. 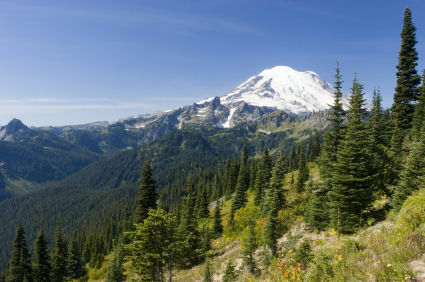 The Northwest Coast region is a temperate rain forest covered in a large variety of trees:western hemlock, sitka spruce,western red cedar,yellow cedar, red alder,willow, douglas maple,shore pine Oregon alder, douglas fir.